lottery 28 - hopeandgives Webseite! The lottery for this week was done with the assistance of Nan Pitre from France. Nan is one of the generous donors for this project. 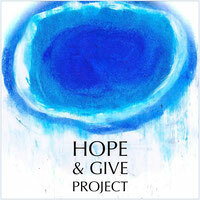 With your financial support and the support of all the other kind donors is this project Hope & Give possible. Thank you once again for your great support. We had 8 applicants in the hat and the winner this time is Christoph Broelsch from Germany. Ich hoffe. daß eines Tages der Fluch Gottes auf die Wohnungen der Gewalttätigen fällt und die Häuser der Gerechten gesegnet werden. I hope. that one day God's curse falls on the flats of the violent and the houses of the righteous will be blessed. We will send a few questions to Christoph. The first painting is for Christoph himself to keep and the second painting will be given away by Christoph to someone he wants to communicate with about their hopes.